Make a drum set out of Djembe, Darabuka and Talking Drums. Take a very, very small guitar, Tzura, Balalaika, African and oriental drums. Play Greek Tzura Russian melodies. Play one Russian Balalaika in American 30�s Swing style. And just sing whatever you feel. Take Russian, English, German or any African language you speak. Take European 3/4 and African 6/8. Take Russian 2/4 and German 4/4. Do you smoke Papirosa? Do you drink Vodka? It helps your voice expression. Have you been to Abijan or Odessa? It helps your body to groove. Have you been to Machorka � Tabakistan? It helps your eyes to smile. Be sad at 140 BPM and funny at 60 BPM. So, now just throw all that stuff together in one big pot, et voil�. And keep it simple. Very, very simple. shake the brain out of your ears and make your hands clap. Is it Folk Rock? Is it World fusion? Is it Blatniak? No it�s just Pushkin Funplugged!! 3 members of Psycho-Active-Ethno-Industrial group Pushkin Boom Beat have made this project. Sound artist and conceptualist. Endless collaborator in different art and music fields Transformable vocalist. Founder and creative source of Pushkin Funplugged and many other projects. A charismatic stage presence of undiminished energy. 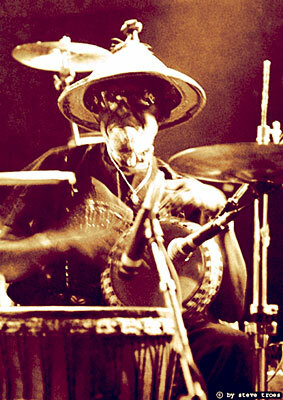 Versatile veteran drummer from Ivory Coast. His beat has powered a legendary orchestra from Abijan and brought Alpha Blondy to the charts. He worked with Manu Dibango and 1001 others. A founder of Academy Percussion and grand patriarch of Berlin�s percussionists. Slavic soul. German head. 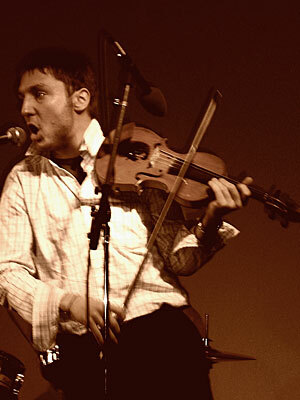 An evocative player of many string instruments in many styles. 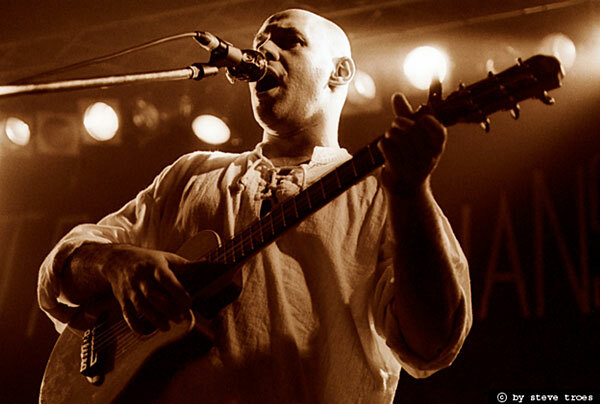 Known to German folk / world music lovers as the leader and singer of Apparatschik and Orchestra Bakul. Electronics maker and fun seeker. The idea of this project came spontaneously, when Sasha was glancing through a musical instruments catalogue and saw a very small guitar � APXT1N from Yamaha. And then he just got an idea of a group, playing Russian Urban Roots based Folk music mixed with unknown for that style Afro � Arabic rhythms� A great groove, but made by small guitar and simple instruments. Like home made & hand made music� And after a long period of Rock, Electroinic, and Jazz experiments Sasha wanted to relax by playing a music, which is so easy to play. Because it�s always there, it�s in the blood. Since childhood. Time ago Sasha was sometimes a guest singer by �Apparatchik�, a German � legend group, who plays Russian Volx - Rock Music. My be he got this inspiration and got back to Russian Roots also through Germans? Or may be it was just a right time to do it? This is maybe the only project, where Sasha also plays music written by others. Except piano playing, where anything is possible. FUNKY FOLK ? ETHNO FUN ? URBAN VOLK ? BLATNIAK ? WORLD MUSIC ? Was passiert, wenn man Jahrhunderte altes russisches Liedgut mit modernen Rhythmen aufmischt? Wenn eine rasende Balalaika in Banjomanier einen Gesang im Stile Odessas der 50er Jahre begleitet? Sasha Pushkin aus St. Petersburg und seine Musikerkollegen f�hren es in ihrem Funplugged-Psrojekt vor. Mit rauer Wodka-Stimme, reichlich Ironie und atemberaubenden Tempi treiben sie der russischen Seele die Melancholie aus. Musiker sorgen dabei mit typischen Instrumenten ihrer Heimat f�r die frappierenden musikalischen Quertreibereien. der vor der B�hne gerade tanzt ! Radio: WDR 5, WDR Funkhaus Europa, SFB 4 Multi Kulti, Radio Brandenburg, Kiss FM, MDR Sputnik, Deutschland Radio, Radio Kultur, RBB, NDR Radio Globo, KSFR Santa Fe Community radio, BBC .